With these words the Italian poet Francesco Petrarch described the value of making a pilgrimage to Rome, which he did in 1350. Dante Alighieri had made the same journey in 1300. Pilgrimages captured the energy and imagination of millions of medieval Christians—a captivation reflected in the numerous pilgrim references in the Divine Comedy. At first, pilgrimages focused on Jerusalem. Such journeys served to unify God’s people as early as King David’s reign. After the establishment of the church, Christian pilgrimages to Jerusalem continued until the latter 1200s. Pilgrimages changed during the Crusades, when many travelers had to arm themselves for protection. Then in 1291 Acre, the last Christian stronghold in the Holy Land, fell to the Muslims, making travel to Jerusalem perilous. Loss of contact with Christianity’s motherland was traumatic. Pope Boniface VIII responded in 1300 by establishing the first Jubilee pilgrimage to Rome. “Jubilee” refers to the Old Testament tradition of holding a Jubilee every fiftieth year during which slaves were freed, debts were canceled, and land reverted to its original owners. Boniface had prepared his capital well for visitors. He was one of a series of popes who recreated Rome as a flourishing city that attracted numerous artists to work on its churches and palaces. So when the fall of Acre made it difficult for Christians to visit the Via Dolorosa and walk in Christ’s footsteps, edifices like St. John Lateran and St. Peter’s Basilica stood as ready alternatives. Wel is him that thider may wende. To make a Roman trek even more attractive, Boniface offered pilgrims previously unheard—of indulgences. The author of the Stacions reckoned that truly devout pilgrims could rack up 32,000 years of pardon for sin—including seven years for each step up or down the stairs at St. Peter’s. Pilgrims flooded into Rome in such numbers that a new gate was opened in the city walls. Travelers in search of insights, blessings, and indulgences came from all across Europe, the British Isles, and parts of Asia. They arrived by ship, animal, and on foot. Some historical records indicate nearly two million visitors, which would have been almost 50 times the city’s normal population. Innkeepers were not the only ones profiting from the traffic. One merchant told of two clerics “standing day and night by the altar of St. Paul’s literally raking in the pilgrims’ offerings.” Such stories led to accusations that the pope was using the pilgrims, selling indulgences to get rich and to finance wars. Technically, however, the offerings were voluntary and had no bearing on whether a pilgrim was granted an indulgence. Medieval pilgrims set off for a variety of reasons. Some sought indulgences or the cure for an illness. For others the pilgrimage was an act of penance or the fulfillment of a vow. Still others journeyed to give thanks for a blessing or to reap benefits for someone else—a sort of pilgrimage by proxy. Early pilgrims often dressed in a sackcloth habit, usually hooded. They carried food and money in a soft leather purse that they attached to their sash-style belts. Pilgrims also generally carried a metal-tipped staff. Some pilgrims received their staff as part of an elaborate ceremony of blessing, commissioning them for their journey. Gradually, the pilgrim robes took on symbolic significance. Returning pilgrims who had visited famous destinations often carried symbols or badges on their clothing: natural souvenirs such as scallop shells or palm leaves, or keys from Rome. These trophies were highly valued, and unwary pilgrims could be robbed of their provisions and prizes. Pilgrims were not the only ones who had to worry about larceny. Pilgrimage sites competed for saints’ remains, and many were robbed. Black-market relic trading became a problem, which is one reason the Vatican does not officially endorse the legitimacy of any relics. It would be impossible to verify them all. Geoffrey Chaucer’s fourteenth-century Canterbury Tales also suggests that a pilgrimage is an opportunity to have a good time. 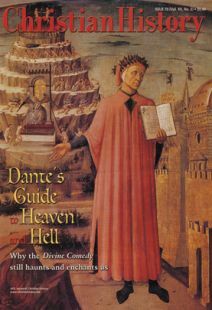 Dante, however, sided with the majority who applauded the spiritual benefits of making a holy pilgrimage. Along with us, though with a swifter stride. On the other, towards the Mount moves contrariwise. If, as a few historians maintain, Dante did not participate in the Jubilee pilgrimage of 1300, he must have been very familiar with it to have described such intricate details. In the second canto of Purgatorio, Dante describes new arrivals from a waiting area at the Tiber River. The musician Casella, a dear friend of the poet, arrives a long time after his death. When Dante asks him the reason for the delay, Casella replies that he was often refused passage, but Boniface’s declaration of indulgences had enabled him to leave the waiting area and begin purifying his soul. In the thirty-first canto of Paradiso, Dante describes a Croatian pilgrim in St. Peter’s who is much affected by viewing the veil of Christ. According to legend, Veronica (not a real name, but a combination of words meaning “true icon") offered Christ a veil as he was carrying the cross to Calvary. This veil is said to bear the imprint of Christ’s face. The veil’s ability to inspire awe in pilgrims reportedly influenced Boniface to grant the centennial indulgence. Jeanetta Chrystie is a freelance writer living in Kirkland, Washington.